This introductory "how to" title enables readers to understand, plan, run, and analyze their own independent atomistic simulations, and decide which method to use and which questions to ask in their research project. It is written in a clear and precise language, focusing on a thorough understanding of the concepts behind the equations and how these are used in the simulations. As a result, readers will learn how to design the computational model and which parameters of the simulations are essential, as well as being able to assess whether the results are correct, find and correct errors, and extract the relevant information from the results. Finally, they will know which information needs to be included in their publications. This book includes checklists for planning projects, analyzing output files, and for troubleshooting, as well as pseudo keywords and case studies. 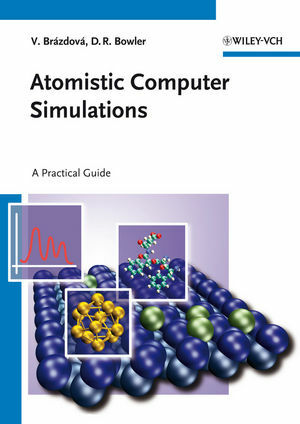 The authors provide an accompanying blog for the book with worked examples, and additional material and references: http://www.atomisticsimulations.org/. Dr. Veronika Brázdová obtained her PhD from Humboldt University Berlin in 2005 with Professor J. Sauer. She is currently a Postdoctoral Research Fellow at the London Centre for Nanotechnology, University College London. Her research is focused on computational simulations of solid state surfaces and interfaces, using mainly density functional theory. She has been collaborating closely with experimental groups. She is also an experienced programmer, particularly in Fortran 90 and the Message Passing Interface. She has supervised many undergraduate students taking their first steps in computational physics. Dr. David R. Bowler received his D.Phil. from Oxford University in 1997. He has been a Reader in Physics at UCL since 2005, and held a Royal Society University Research Fellowship from 2002-2010. He is a PI in the London Centre for Nanotechnology and the London-wide Thomas Young Centre. He has driven the development of the massively-parallel linear scaling density functional theory code, Conquest, and collaborates extensively with experimental groups on the growth and properties of nanostructures on semiconductor surfaces. 4 What Exactly is Calculated?